Yes, it's a record that exists and San Francisco's Asian Art Museum is responsible for getting 2,405 people together to set it. An American art museum managed to get over 2,400 people to come together to set the Guinness World Record for the world's largest human flower formation. 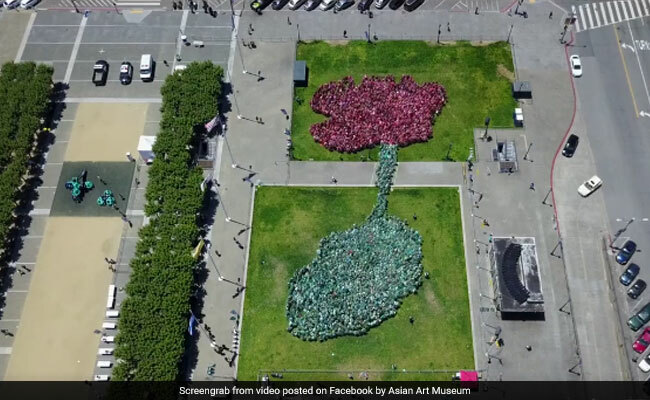 The Asian Art Museum, in San Francisco, California, offered pink and green plastic ponchos to the 2,405 participants, who stood patiently in the shape of a lotus flower on Sunday for five minutes. The museum posted a short time-lapse video of the event on its official Facebook page. The museum called the record attempt "part human be-in, part artwork...and ALL FUN." "Rising from muddy waters, the lotus is recognized as a symbol of transcendence and beauty untainted by hardship. LOTUS LIVE invites all to stand united and rise above challenging times, to express...values of diversity and inclusivity through peaceful action," the museum wrote on its official website. The attempt beat the previous Guinness World Record of 2,297 people forming the shape of a lilac flower in Rochester, New York.